Android Market is not available officially on the newly released Kindle Fire. Since Amazon released the source code for the Fire, however, the device had been rooted making it possible to add it anyway. Follow our step-by-step instructions and you’ll be well on your way to browsing the Market then installing apps and games right on your device! Before we begin we would like to say the process is complex and not for the casual computer user. Rooting the device, moving and installing files, and installing a third party alternate launcher will be necessary. Read the entire instructions before you begin to determine if you can complete the entire process. If you are ready to proceed then we can start. Make sure to root your Kindle Fire; we posted a friendly guide that guides you through the process. Once your device is rooted, come back to this page. It’s okay. We’ll wait. Root Explorer App (Download Link) While this app is $3.99, you may try to find an alternative, as long as it allows you to change read only/read-write permissions. Now, on your Kindle device, navigate to Settings > Device. On this screen confirm that “Allow Installation of Application From Unknown Sources” is switched to the ON position. Next, we’ll need to ensure you have activated Side Loading Apps on the Kindle Fire. You may have already accomplished this task when you first rooted your device but it’s always best to double check. If you’re sure they’re activated, skip ahead. Check off the Unknown Sources box. Transfer the two .apk files you have downloaded earlier and place them somewhere on your Kindle Fire. Congratulations! 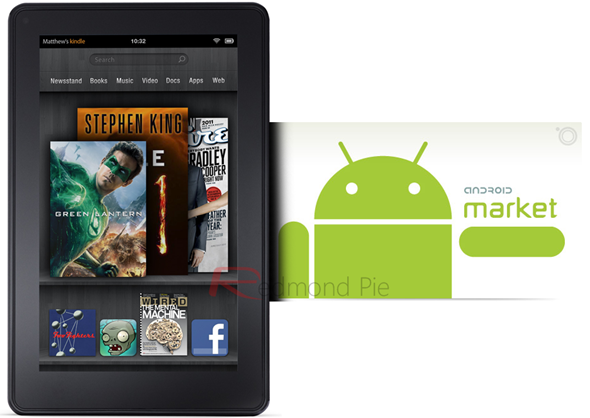 The Android Market is now on your Kindle Fire. While the installation process may seem lengthy and tedious, you may find value in the long run by having a larger selection of apps. Not all of them are available; we’ll have to wait for the developers to make them compatible. As always, tinkering with the inner workings of any device requires at least basic computer know-how. Use caution.